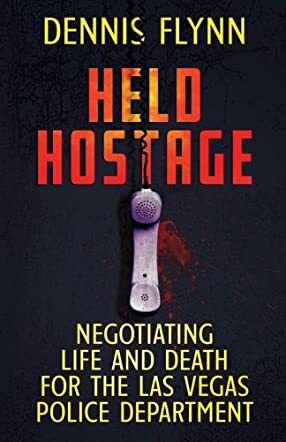 Held Hostage: Negotiating Life And Death For The Las Vegas Police Department by Dennis Flynn is a book of true stories. Lieutenant Dennis Flynn was a police negotiator for nearly 20 years, responding to hostage calls, suicidal people and many more situations that require the skills and techniques of a veteran negotiator. Working with the Las Vegas Crisis Negotiation Team, Flynn had only one goal with every call – to bring them out alive. This book takes us behind the scenes of some of the situations police negotiators have to deal with; life and death situations, and how they resolve the calls. This is an open, honest look at life as a police negotiator. Held Hostage: Negotiating Life And Death For The Las Vegas Police Department by Dennis Flynn was one book I could not put down. I love true crime stories anyway but this was something very different. Never before have I read such an honest and open account of life as a police negotiator, a no-holds-barred look at what the police have to deal with day in, day out, complete with photos. This is written in a frank way, an easy-to-follow and gripping manner. What we see on these TV shows is nothing compared to the reality and Dennis even managed to convey the emotions of every situation, not an easy thing to do. If nothing else, this book should open eyes and make people really think about what goes on, the real truth and not the glamorous job we see it portrayed as in TV shows and movies! Great book, and I hope there’s more to come.